Get the reimbursement you deserve from payers. Make your practice more attractive to networks. Improve your reputation and transparency to convert website visitors into new patients. Retain current patients by uncovering issues and creating a better patient experience. Address critical issues like physician burnout, quality, and safety. The Patient Experience Platform, along with the Five-Star Reputation Management Tool, provides practices with credible, reliable, specialty-specific data insights into what patients are saying about your practice. The survey is specialty-specific to ensure practices see data insights relevant to what matters most to you. The Clinical Effectiveness Platform is a data analytics platform that helps uncover critical best practice insights for both patients and physicians. The platform assesses high risk areas that leave your organization vulnerable and provides resources to guide your team in the direction of improvement to strengthen patient engagement, improve patient satisfaction, enhance physician work satisfaction and culture, and reduces risk. The Reimbursement Effectiveness™ Platform helps practice administrators and physicians enhance reimbursement negotiations, leading to more reimbursement dollars for your practice. Insights into hidden opportunities for increased reimbursement that are typically only available to the payer help you ‘even the playing field’ and negotiate more effectively with payers through high quality, credible data and a Value Story Report that helps you clearly define your practice’s value in the market. 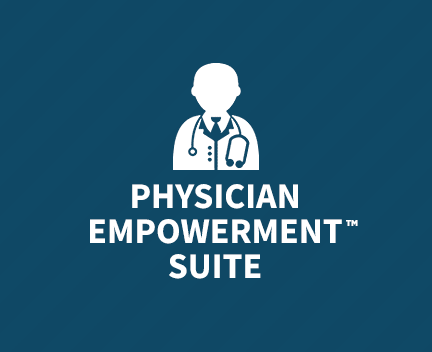 Contact us to learn more about the Physician Empowerment™ Suite or to schedule a demo.